The historic Thornewood Castle in Lakewood, Washington not only has a long and rich history, it is also called home to several resident ghosts. 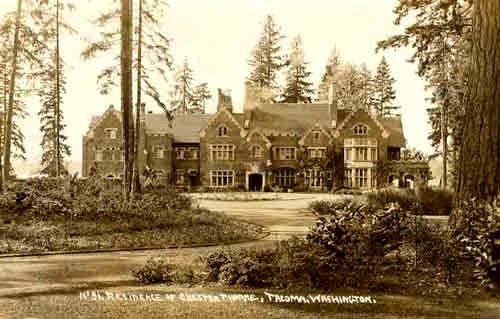 This magnificent three story manor home was built by Chester Thorne, one of the founders of the Port of Tacoma. Taking almost four years to complete, the 27,000 square foot manor was finally ready in 1911. 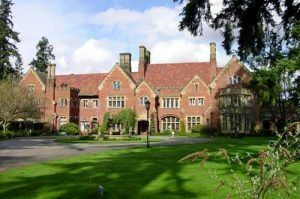 Only the very best went into the building of the manor, including 400 year old bricks from an original English castle. Designed by famous architect, Kirkland Cutter, the crystal windows were made in England and the stained glass panels date as far back as 1300. The English Tudor/Gothic mansion, having 54 rooms, including 28 bedrooms and 22 baths, is one of the few genuine private castles in the United States. Thorne was fascinated with the grandeur of old English estates and the wealthy man was determined to reinvent his own castle and dream house. Built to last through the centuries, Thornewood Castle has solid three-foot-thick foundations, 18 inch floors of concrete and cinder, 10 inch walls, and hand hewn woodwork from ancient English oak, held together by solid wood dowels. Three ships had to be commissioned to transport the original bricks, wood and windows around Cape Horn to the Pacific Northwest. After the house was built Thorne hired a landscape architectural firm that turned 37 of the estate’s 100 acres into formal English gardens that required a full-time staff of 28 gardeners. Inside, the staff included 40 servants to look after the needs of Chester, his wife, Anna, and their daughter Anita. Over the years, the house hosted many fine garden parties and dinners with the likes of Presidents Theodore Roosevelt and William Howard Taft among some of the guests. 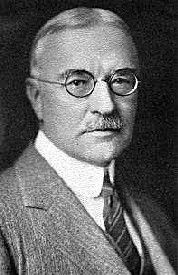 Alas, the wealthy banker and businessman died on October 16, 1927, after having enjoyed his home for over a decade and making significant contributions to the Seattle/Tacoma area. Anna Thorne was elected to the board of directors of her husband’s bank, and continued to oversee her husband’s philanthropic efforts in the community, as well as the mansion and gardens. By that time, their daughter had married Cadwallader Corse and the couple, along with their son, also lived in the large manor. Later, the pair would divorce and Anita remarried Major General David C. Stone. 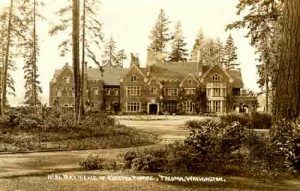 When Stone was transferred to the Panama Canal Zone, Anna found Thornewood to be to big and lonely and moved to a smaller Georgian home that she had built at the corner of North 5th Avenue and D Street in Tacoma. When the Stones returned to Thornewood, Anna also returned to the castle, dying peacefully in 1954. When General Stone passed away in 1959, Anita sold the house and grounds to Harold St. John, who subdivided the land for 30 home sites. Just over four acres were reserved for the mansion, along with 110 feet of the lake front. Over the next several years the house was sold several times until it was purchased by current owners, Wayne and Deanna Robinson in 2000. Today, the historic castle is said to host a number of spirits that refuse to leave, either for their love of the manor or for the tragedies that occurred over its long history. The most prevalent sighting is that of Chester Thorne himself, who has reportedly made several appearances over the years. In what was his former room, light bulbs are often found to be unscrewed. Others have reported seeing Anna, Chester’s wife, sitting in the window seat of her room, overlooking the garden. Anna’s room is now the bridal suite which contains an original mirror from her time, where guest have reported seeing her reflection. Reportedly, the grandchild of a former owner drowned in the lake and occasionally guests have seen a small child standing alone by the lake, only to rush down and find no one there. Now on the National Register of Historic Places, the castle now serves as a gracious country inn that has been lovingly restored, offering all the modern conveniences of modern lodging. The land also presents its guests the opportunity to roam the grounds, a lovely ½ acre sunken English garden, and fishing, swimming and boating on the American Lake. Appropriately, Thornewood Castle served as the site for the filming of Stephen King’s mini-series “Rose Red” in 2002. 8601 N. Thorne Lane S.W. © Kathy Weiser/Legends of America, updated May, 2016.